I would like to start this month’s article by thanking all those choristers who enable us to keep a choral presence alive at St Peter’s during the summer months (albeit in a slightly altered service pattern, details of which can be found in the diary section of this issue of the magazine). The fact that St Peter’s can offer choral services fifty-two weeks of the year really is quite exceptional, and something of which I know we are justly proud. 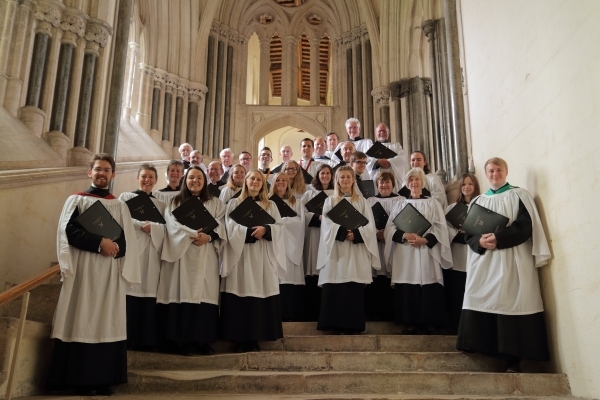 Cathedral communities are also keen to provide choral worship throughout the year, and so it is commonplace for such places to invite suitably qualified visiting choirs to sing in place of the resident choir during the holidays. St Peter’s Choir has a rich history in this area: The first such trip was to Lichfield Cathedral on Low Sunday 1969 (the choir was delighted to return there – on the same day – just forty-seven years later in 2016!) and it has been a particular pleasure to develop this area of the choir’s work during my time as Director of Music. The past ten years have seen the choir lead the worship at the cathedrals in Canterbury, Chester, Coventry, Derby, Durham, Ely, Gloucester, Lichfield, Lincoln, Llandaff, Norwich, Peterborough, Ripon, Salisbury, Southwark, Southwell, St David’s, Wells, Winchester and York, as well as the abbey churches in Bath, Tewkesbury and Westminster, and the chapel of Windsor Castle. Further afield, recent years have also seen international tours to Cologne and Paris. Visits such as these form an important part of the choir’s routine; when singing away from home, we take very seriously our role as ambassadors for our own church, parish, city and diocese, and so it is always particularly rewarding when the choir’s singing and churchmanship are kindly complimented by cathedral clergy and congregations. It is also enormously fulfilling for us to be able to sing in some of the most famous and inspiring ecclesiastical buildings in the world: we often find ourselves inspired not just by jaw-dropping architecture (there are too many examples of this to mention, but the famous ‘scissor arches’ at Wells were a recent highlight) and historical significance (the two ‘royal peculiars’ in the list above were particularly humbling – I shall never forgot conducting in Windsor with one foot on the tomb of Henry VIII! ), but often also by wonderfully satisfying acoustics (again, a number of highlights, but Coventry is particularly exciting in this regard), particularly eloquently delivered and choreographed liturgy (UK cathedrals almost all set such superb examples here, but as one might expect, Westminster Abbey runs an exceptionally tight ship in this regard) and magnificently colourful and powerful organs (ask Mike Leuty and Lee Rooke for their favourites!). As you can imagine, such a feast for mind, body and soul acts as a powerful ‘carrot’ and the choir is often at its biggest for these visits, attracting a large number of our part-time and visiting choristers as well as the full-timers. But the icing on the cake is always the sight of friendly faces in the congregation; if you’ve not joined us on a choir visit yet, do think about it – upcoming trips are to Beverley Minster (27-28 October 2018), Liverpool (Anglican) Cathedral (25-26 May 2019) and Worcester Cathedral (2-3 November 2019). Although the choir and organist team may be able to realise their fullest musical potential during these visits, it is without question that our principal function and responsibility is – and always will be – to the regular worship at home at St Peter’s and (on fifth Sundays) at All Saints’. If any proof of this were needed, let me end where I started, by recognising with gratitude the hugely impressive commitment made by that loyal core of choristers who, mindful of the line in one of our favourite hymns, “the voice of prayer is never silent”, enable choral worship to continue in our parish all year round.